Guide dogs and therapy dogs are so much more than empathizing friends. They are the super heroes who help heal the world in their own special ways. Jaquie, a young Florida woman, has battled for over eight years the multiple chronic illnesses − asthma, allergies, chronic migraines, anaphylaxis, narcolepsy, epilepsy and others. But given the iron willed lady Jaquie is, she doesn’t let her illnesses restrain her from living a happy life. Sure, there are times when the going gets too tough – the occasional anaphylactic episodes which can trigger anywhere. Thankfully she can always count on Harlow, her service pup in training. 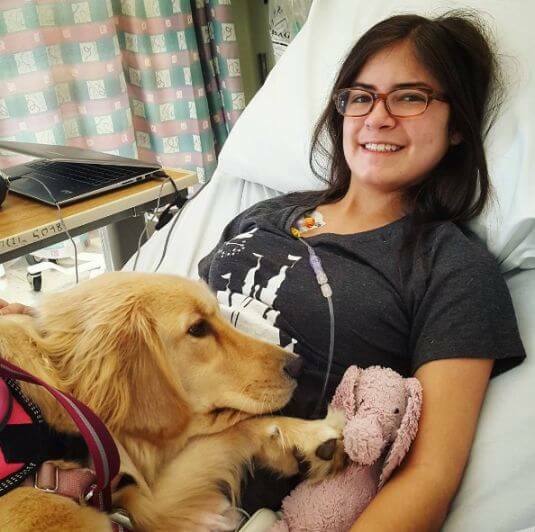 This sweet little guide dog helps human suffering chronic illnesses. Harlow, the service dog is more than an internet superstar ― this golden retriever can do laundry, help with the food shopping…you get the idea! Also see: How Therapy dogs are calming passengers at Mumbai airport! As a service dog, Harlow is vital to Jacquie who struggles to pick things up and bend down as she suffers from postural orthostatic tachycardia syndrome (POTS), which is caused by her heart rate abnormally rising when she sits or stands. Jaquie and Harlow know how important it is to spread awareness about fighting chronic illnesses with a smile and service dogs. On her Youtube Channel, Jaquie shares her experiences related to illnesses, treatments and life with Harlow to inspire others with the zest for life! And of course, Harlow’s Instagram showcases not only cute fluffy pictures but insights on life. At Dog with Blog, we wish the incredible team of Jaquie and Harlow all the very best, keep fighting! Here’s to service dogs and their humans. Posted on February 16, 2017 August 10, 2017 Author Abhishek JoshiCategories Hail the hound! Previous Previous post: See How This Wonderful Dog Hugs Everyone She Meets! Next Next post: 20 Beautiful Untranslatable Words That Your Dog Knows!